What's in the "My Account" Dashboard? If you use any Google service that requires a login, such as Gmail, Calendar, Docs, Google+ or Blogger, you have a Google account. Each service has a variety of settings, some with privacy and/or security implications. So it's a good idea to occasionally look at the whole picture. To use the Google "My Account" dashboard, you must be signed in to your Google account. The main page of the My Account dashboard now shows three logical topics: 1) Sign-in & security, 2) Personal info & privacy, and 3) Account preferences. Let's take a look at each. When you click on any of the three major topics, you are taken to a page that’s divided into two frames. On the left is a sidebar showing all three major topics and their subtopics, a very easy way to navigate to any setting desired. In the main window you’ll find specific settings you can change or historical data you can review. The Security Checkup under Sign-in & Security walks you through your account recovery information; devices that recently connected to your account; access settings for “less secure” apps; account permissions granted to other apps; and Gmail settings. A recent connection from an unfamiliar device may indicate that someone else has your Google password. It’s good to review account permissions and cancel those that you no longer wish to grant. If your account recovery email address or phone number has changed, this checkup reminds you to update it. 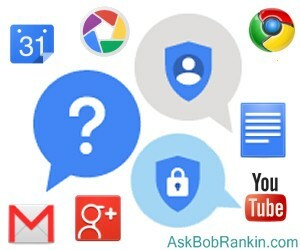 The Personal info & Privacy section is where you can control what information about you and your online activity Google saves and uses to tailor ads to your interests, location, and so on. Let's click on the "Your personal info" link first. Aside from verifying your name, email and phone, the item I find most useful is "Search settings." Click the "Manage settings" link next to Search Settings. At the bottom of the Search Settings page, you'll see a link to view, edit or turn off your Google search history. You can even search your search history, and delete items you don't want to be stored there. In addition, links for your YouTube Watch History and YouTube Search History are available on this page. Moving back to the Personal info & privacy category on the dashboard, there is even an option to opt out of all interest-based Google advertising across the Web. Click on "Ad settings" then click "Manage your ad settings" then scroll down to the bottom of the next page. You have a choice to make here. Do you want ads that are relevant to your age and interests, or ads that are completely random? The third major topic on the "My Account" dashboard is Account preferences. It includes your language preferences and input tools, an overview of your Google Drive storage used and remaining, and a “delete your account or services” section. Yes, you can delete that unused and unwanted Google+ page. You can delete your YouTube account and all its content, and your Gmail address and all the info in that account. You can even delete your Google account and all data associated with it across all Google services. The power is yours! Be careful with that power, though; once something is deleted it cannot be recovered. The new "My Account" dashboard is a vast improvement over the old mishmash of random pages. It makes security and privacy options more obvious and easier to manage. Spend a few minutes there and make sure all settings are in line with your preferences and expectations. Most recent comments on "IMPORTANT: Google Security and Privacy Dashboard"
I have always tried to avoid anything associated with Google, because I am concerned about what they do with my personal information. The "My Account" dashboard sounds like a giant step in the right direction towards addressing my concerns. Thanks for a very interesting and informative article! Thanks for bringing this important topic to our attention. Your explanatory tour of the Google Dashboard helps understand how to navigate it greatly. I always appreciate the care and research you put into your articles and the timeliness of the things you investigate. Keep up the great work. There is one thing with the Google Apps, esp the mobile apps, that I do not like. They require/want permission to access just about everything including permission to access camera, mic, modem and permission to change the settings. Access to all personal data and contact/friends list. As well as permission to make posts and send emails using my ID. Why is it necessary to have access to all of this just to use an app/program? Having my email and the personal info that I decide to share should be enough info to target advertising profiles. The security and privacy settings are a joke since permission has to be given to access my life. EDITOR'S NOTE: The next version of the Android OS will allow you to set permissions individually. The privacy with Google is compromised by having one password which signs in to several programs. This alone opens the door to hackers access to several programs from Google. EDITOR'S NOTE: 2-factor authentication solves that problem nicely. What about those of us who don't have their phones permanently attached to their hands. Wish there was another option. Privacy online doesn't exist any more, trust me. We can try to run but we can't hide from Google's attempt to fetch BigData on all of us. Their recent and 'kind' offer to get car insurance quotes from 5 companies automatically for us sounded innocent but that was another way of them finally getting our driver licenses and other such information to add to the pile of all the other information they already have. I hear they may try to do the same with our medical history and then they will have a complete dossier on all of us for once and for all! Borg was correct "Resistance is futile, you shall be assimilated"! Am I really getting/sounding too paranoid? Great article Bob and very informative, thank you. However, two factor authentication is all well and good, but it relies on having cell phone service. At home our cell phone service is nonexistant so we will have to manage just the way we were before. Thank you so much Bob for keeping us up to date on all that's happening in cyberspace. It is greatly appreciated! People are so afraid of Google who just wants to advertise to you to get their bucks but they turn over their whole lives to Facebook and the rest. I would echo what Fred has said about how helpful your articles have been and especially this one about Google security. Thank you.